The Witsuwït’en live in and around the communities of Burns Lake, Houston, Smithers and Hazelton in northwestern British Columbia. Along with their western neighbours, the Gitxsan, they launched a court case claiming ownership and jurisdiction of their traditional territories that resulted in the ground-breaking Delgamuukw decision of the Supreme Court of Canada in the fall of 1997. Canyon Creek: a script, tells the disturbing story of the eviction of a Witsuwït’en family from its homesite near Smithers in 1920. It has a foreword by Darlene Glaim-Buchholz (Gyologet), a Witsuwït’en hereditary chief. By telling one family’s story, Canyon Creek: a script demonstrates how the early surveying and mapping of British Columbia had far-reaching consequences on both native and non-native residents. It identifies the impact of Canadian and BC land use policies on First Nations communities and puts the present status of Aboriginal land claims and self-government in an historical context. Canyon Creek: a script’s innovative design was developed collaboratively by Dorothy Giesbrecht, Megan Hobson, and the author. It includes many archival photographs and drawings by Hobson. For many years now, I’ve been invited to accompany students from Jonathan Boone’s First Nations Studies class at the Bulkley Valley Christian School on a tour that includes the homesite referenced in Canyon Creek: A Script. We travel a path following the Telkwa-Morictown Highroad (the old Bulkley Valley Road and part of the Collins Overland Telegraph route), dipping down to Canyon Creek, then up Jollymore Road to Jack and Elizabeth Joseph’s old cabin. From there we can look across a big swamp, some aspen bush to the fields below what’s known locally as the Baptiste Reserve, the place where one Witsuwït’en, John Baptiste, successfully prevented eviction from his homesite. Along the way, I usually pull out the 1913 township map, Canyon Creek Mary’s Witsuwït’en family tree, a typed transcript from the 1915 testimony given to the Royal Commission on Indian Affairs by John Baptiste, Tyee Lake David, Big Pierre, Tyee Lake Abraham, Round Lake Tommy, Moose Skin Johnny and Jimmy Thomas, son of Canyon Creek Mary and Thomas (Jack Joseph is listed as the translator) and my notes from interviews done while writing the book. We read the book together, point out features on the landscape (the path of the old trail the Witsuwït’en used to connect their properties, the site of the burned-out house, the old root-cellar) and talk. Over those years, Jonathan Boone has made a tremendous effort to inform his mostly non-native students about the history of the Witsuwït’en upon whose territory our community is built. This year I was especially pleased to accompany students from the Moricetown I Count High School on this, what is for me, a pilgrimage. As we stretched out the very long genealogy chart, some of the students recognized family names. We usually end our trip at the old Joseph house, still standing after, I suspect, more than one hundred years. Jack and Elizabeth had thirteen children altogether – let’s hope some of the kids had grown and moved out before the littlest ones came along! Things are definitely changing along the old Bulkley Valley road, slow as those changes might seem. Thanks to the staff and students for asking me to accompany them for a few steps on their journey. Please be advised that the Office of the Wet’suwet’en fully endorse the Canyon Creek story that was authored by Sheila Peters and Meg Hobson. The authors recently displayed it at a meeting in Smithers that was attended by a majority of Wet’suwet’en Chiefs and the Chiefs agreed with the story. As our elders who testified in the Delgamuukw Courtcase will attest very little of our history was written down in any format, therefore it is important that books such as the Canyon Creek story be exposed to as wide an audience as possible. I wasn’t going to review Canyon Creek; a script, the fine combination of Sheila Peters’ writing and Megan Hobson’s illustration. I’m not well enough informed about land claims and valley history to evaluate this book, I reasoned. My taste in art and illustration is strictly gut reaction. Could I offer informed comment? But this is a beautiful book about issues that reach beyond their Bulkley Valley settings. I enjoyed it so much I wanted to talk about it. But this book eludes lazy, easy definitions; makes reviewing challenging; forces one to reach beyond standard, initial labels. It’s not conventional history. It’s also neither essay nor fiction. This is the story of the eviction of some Wet’suwet’en people from their homes along Canyon Creek. Peters calls her version a script. The format allows evocative, thought-provoking narration of events which shattered lives. Narration gained from personal aboriginal accounts, testimony and accounts of missionaries, surveyors and white settlers is dovetailed with musing commentary. Peters’ images in words complement the images Hobson has created with archival photographs. The script format allows delightful roaming though time and place, gives Peters a vantage point from which to explore and comment on these human and cultural tragedies. It also serves as a challenge to our preconceptions of history. The history student in me repeatedly lowered my gaze in search of footnotes, instinctively sought captions despite assurance that the images were used for evocative visual qualities only. The format puts the issues in broader context too, that of our views of aboriginal people, of the western movie and novel, of images of pioneers. 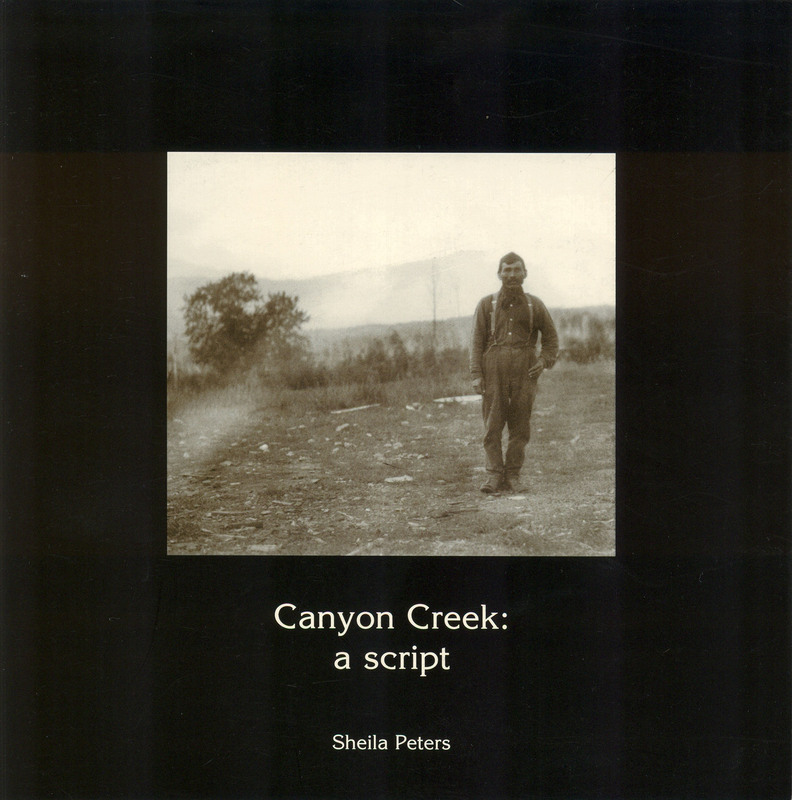 Canyon Creek: a script is also very much a personal story by an author living near Canyon Creek with a sense of the history of her yard and the urge to comment on it. This book will be seized upon for causes, but it should be read most of all for its ability to prompt thoughtful examination of our past. I don’t know if I’ve seen anything where the text and visuals worked so strongly together. The sense of loss and injustice done the Wet’suwet’en people is overwhelming. sne cal yegh, thank you, for sharing one of the most difficult aspects of our Joseph family history. I often refer to this book to share our story, and so many people are amazed that this happened here in the Bulkley Valley, in BC and in Canada. Thanks, Sandra. It seems like there’s a circle here – this was Creekstone Press’s first book and now it’s publishing Shared Histories which gives the family some room to tell more of its story. Hard to read, but so good to have it available.